Raith Rovers have rewarded winger Nathan Flanagan with an 18-month contract extension. The 21-year-old signed for Raith in the summer, initially on a short-term deal until January, following his release from newly-promoted Premiership side St Mirren. He had to quickly prove himself at Stark's Park, and after establishing himself in the first team with a string of impressive performances, manager John McGlynn moved to secure the pacy wide man on an extended contract until May 2020. Speaking exclusively to Fife Today, McGlynn said: "It's well deserved. Since myself and Paul came in he's been excellent. "He's listening and learning, and when we go back over the video analysis, he's ticking the boxes and doing everything we're looking for. "He's been a spark, he can change games in seconds, and he's the type of player that fans want to come and watch. "I'm delighted he's had the trust in us that he wants to push for promotion." Flanagan started in the Hearts youth system before moving to Paisley and gained experience of first team football in Leagues One and Two while on loan to Annan Athletic, East Fife and Elgin City. Despite his early knock backs, McGlynn believes he can go far in the game. "In the modern game there's not many wingers going around," he added. "If he can knuckle down, keep working at his game then he can possibly have a bright future. "He came through at Hearts, and had two or three clubs on loan, but sometimes it's just timing. "These guys have to take a wee step back and it can be the making of them, but it can also break them. "They then have to recognise that they have to work even harder to prove people wrong. "Nathan comes into the category. He's done well here, playing with a smile on his face and enjoying his football. "But he needs to keep it going and continue developing if he wants to to the next level." Flanagan has benefited from a sustained run of first team action that has seen him score three goals in 17 games, two of them as sub appearances. He has also provided seven assists from wide areas for his team mates ranking him as one of the most creative players in the division. "It’s good to have my future settled," the winger said. "I’m enjoying my football here and hoping I can keep improving and performing for the team. Chairman Bill Clark was also delighted with the players commitment to the club. 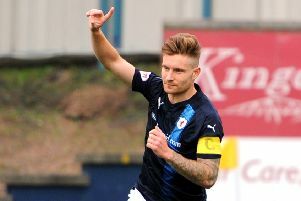 "He has settled in well at Stark’s Park and adds skill and speed in wide positions which have benefited our strikers in recent matches," he said. "He also has an eye for goal and will be a valuable addition to our firepower as the season unfolds. "With his immediate future now settled I look forward to him playing with increased confidence as an important member of the first team squad."